Bedford Blues have announced the loan signings of Wasps youngsters Piers O’Conor and Alex Lundberg ahead of the 2015/16 season. 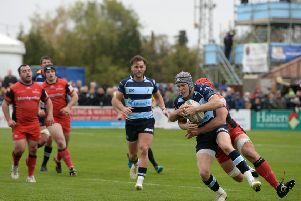 The pair have already played on the Goldington Road turf when they were involved in the Mobbs Memorial fixture at the beginning of the month. As well as that appearance, both players have been training with the first team at Wasps this season and were regular members in the clubs LV=Cup campaign earlier this year. Speaking about the signings, head coach Mike Rayer said: “I watched Alex at Rosslyn Park last year and he was quite outstanding actually in the loose play; the next progression for him is Championship rugby after playing National one for a couple of years so we’re excited about that. “Piers is a class act, he showed real ability against the Army in that fixture – even at 13 when he is predominantly a 15. These two loan signings from Wasps, as well as the 10 players who announced last week they will be at the club next year via either re-signing or joining from elsewhere, shows how quickly Rayer and his backroom staff are working to get the players he needs to build for next year.